We will introduce by way of discussion other approaches to encourage beaver and have the class provide their experiences in working with beaver, including what can go wrong. There are other means to encourage beaver to manipulate a system. However, we also need to acknowledge the potential damage that can arrive with beaver activity. This will help us prevent these mishaps or prepare us for backup approaches. Failure to do this when these techniques are somewhat novel, could jeopardize future projects when restoration goes awry. 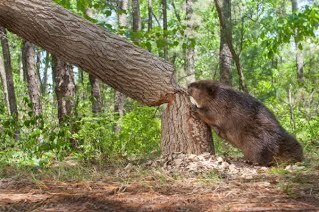 Beavers can cause damage to property, such as cutting down an old oak tree. Lesica P and Miles S. 2004. Beavers indirectly enhance the growth of Russian olive and tamarisk along eastern Montana rivers. Western North American Naturalist. 64(1): 93-100. ARJO, W. M. 2003. Mountain beaver: the little rodent with a large appetite. Western Forester 48(4):10-11. 156K. EPPLE, G, J. R. MASON, E. ARONOV, D. L. NOLTE, R. A. HARTZ, R. KALOOSTIAN, D. CAMPBELL, AND A. B. SMITH III. 1995. Feeding responses to predator-based repellents in the mountain beaver (Aplodontia rufa). Ecological Applications 5(4): 1163–1170. CAMPBELL, D. L. 1994. Mountain beavers. Pages B53–B60 in S. E. Hygnstrom, R. M. Timm, and G .E. Larson, editors. Prevention and control of wildlife damage. University of Nebraska Cooperative Extension, U.S. Department of Agriculture–Animal and Plant Health Inspection Service–Animal Damage Control, and Great Plains Agricultural Council–Wildlife Committee. Lincoln, Nebraska. EPPLE, G., J. R. MASON, D. L. NOLTE, AND D. L. CAMPBELL. 1993. Effects of predator odors on feeding in the mountain beaver (Aplodontia rufa). Journal of Mammalogy 74:715- 722. CAMPBELL, D. L., J. P. FARLEY, AND R. M. ENGEMAN . 1992. Field efficacy evaluation of pelleted strychnine baits for control of mountain beavers (Aplodontia rufa). Proceedings of the Vertebrate Pest Conference 15:335-339.